The Most Wonderful Time of the Year: Giving Rocks! Ho-Ho-Holeee crap, it’s December already! 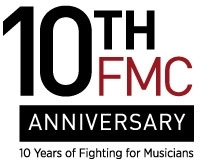 To celebrate the season of giving, FMC is once again asking our friends, supporters, peers, associates, moms, dads, second cousins and any one else within earshot to contribute to our humble organization. 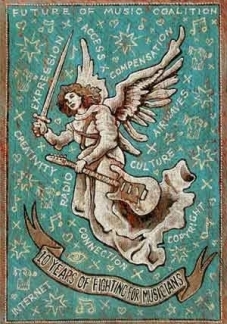 FMC 10th Anniversary posters by the amazing Jon Langford! 10 years of giving musicians a voice in important debates about the future of music. 10 years of original research showing how changes in technology and policy impact musicians’ lives and careers. 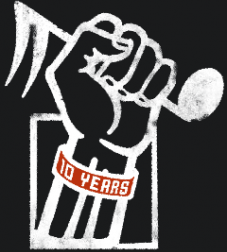 10 years of fighting to ensure musicians can earn a living making the music we love! This is it folks: the final five days before the 10th Anniversary Future of Music Policy Summit! FMC staff has been in high-gear for months now to make this our best conference yet, and we think we’ve done it! Music industry heavy-weights and international recording artists converge in Washington, DC this October for one of the most significant conferences in the music industry calendar.